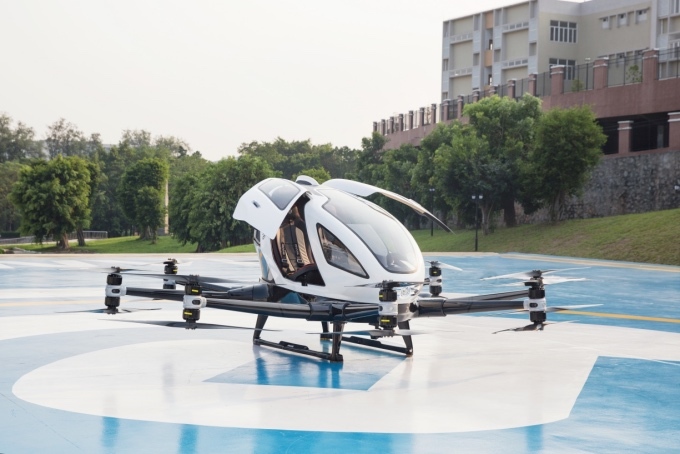 Guangzhou/Ried, 21 November 2018 - The leading Austrian aerospace group FACC has entered into a strategic partnership with the Chinese technology company EHang, which specializes in autonomous air mobility. EHang is one of the world's most promising autonomous air mobility companies and was named one of the "Most Innovative Companies of the World" by Fast Company magazine in 2016. In a joint effort, the autonomous air vehicles (AAV) are to be optimized and made ready for series production. In addition, solutions for the individual air mobility of the future will be jointly developed, and research will be conducted on new technologies for AAV. At the beginning of November, the two companies signed a strategic partnership agreement in Guangzhou, China. 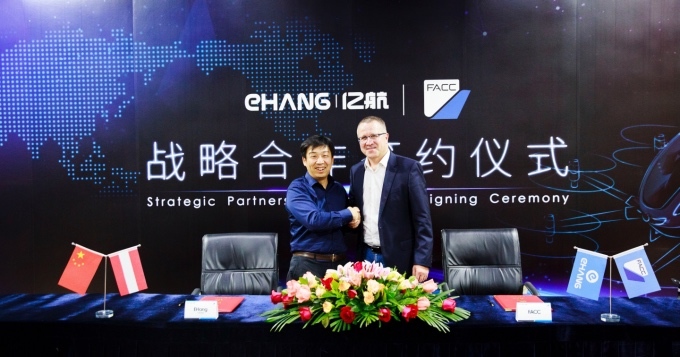 Ehang/FACC Signing Ceremony：EHang CEO Huazhi and FACC CEO Robert Machtlinger at the signing of the partnership agreement. "As a technology partner of the global aerospace industry, FACC has a broad spectrum of systems expertise ranging from research, design, development, certification and global production to the maintenance of high-tech products for aircraft. This enables us to be fully equipped and dedicated when it comes to implementing safe and highly efficient lightweight solutions for individual air mobilityaround smart cities. In this respect, the partnership with EHang takes us a big step forward," says Robert Machtlinger, CEO of FACC. EHang 216：FACC and EHang are working together on Model 216. As part of the strategic partnership, FACC and EHangcontribute their resources and networks, thus creating optimal synergies to jointly advance technologies and solutions in the field of urban air mobility. 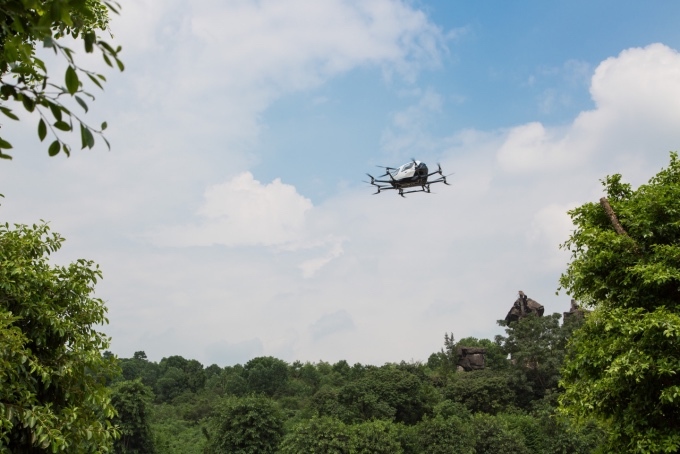 EHang is the inventor and expert for all questions relating to autonomous air mobility, particularly with regard to connectivity and software solutions. FACC supports high-tech hardware with development, certification, production and worldwide aftermarket services. 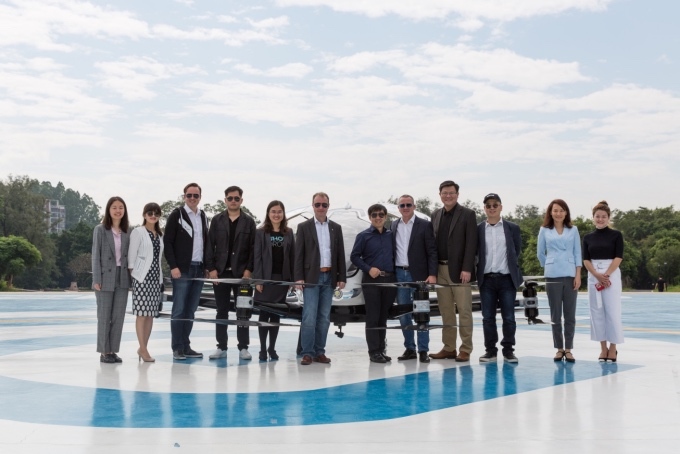 EHang/FACC Leadership Team：The leadership team of EHang and FACC is working together on the mobility of the future. The population of the world's cities is growing rapidly. By the year 2030, 5.2 billion people will live in urban regions, about one billion more than today. The proportion of urban dwellers will then be 60 percent of the world's population, which will mean that people will be affected by traffic jams on the roads on a daily basis. Air taxis are expected to help solve traffic problems in cities by using airspace as a "third dimension". Newly developed, environmentally friendly electric drives, high-performance batteries with short charging times, minimal space requirements for take-off and landing areas, fast computers and big data create the necessary conditions for tackling urban air mobility concepts within and between cities. In addition to transporting people or goods, autonomous aircraft offer numerous other applications such as flights to transport urgent emergency goods or high-risk operations from the air in the event of environmental catastrophes. The market potential is very promising: According to a study by Roland Berger, there is a demand for air taxis worth EUR 32 billion over the next decade. "Flying to work instead of being stuck in traffic jams - this has already become reality in some regions of Asia, and we wish to make it possible in the rest of the world,” explain Robert Machtlinger and Hu Huazhi in unison. EHang 216 in flight：The EHang 216 flies fully autonomously and without a pilot. EHang is an intelligent aerial vehicle company with integrated capacities of R&D, manufacturing, sales and services, headquartering in Guangzhou, China. EHang is awarded by the global influential media Fast Company as one of the “Most Innovative Companies” and ranked into the top 3 companies across the world’s UAV industry. With the mission of “let humankind fly freely like a bird”, EHang provides customers from various industries with user-friendly, safe, intelligent and efficient aerial products and solutions, such as autonomous aerial vehicles for urban air mobility, command & control center and connected commercial drones for smart city management, drone formation light show and drone logistics, etc. As the forerunner of cutting-edge UAV technologies and application models in the global civil drone industry, EHang consistently explores the boundaries of the sky to make the flight benefit our better life in the smart city. FACC is a worldwide leading aerospace company in design, development and production of innovative aircraft components and systems. Being the technology partner of all major manufacturers, FACC works together with its customers on developing solutions for the mobility of the future. Every second, there is an aircraft taking off with FACC technology on board. In full year 2017/18, FACC achieved more than 750 million Euro in revenues. FACC employs 3,400 people from 38 nations and working in 13 countries worldwide. The company is listed in the ATX of the Vienna Stock Exchange and part of the Fortune-500 Group AVIC, providing access to the largest growth markets within the industry. For more information please visit facc.com.